Who doesn’t like a good whisky? That’s right, no one! That’s why the Excurcie is back with the Whisky Tasting. For the low price of €13,50 you will get to taste 6 whiskies that are guaranteed to be even more special than the ones we had at our previous tastings! Also, you will be tested on your knowledge of whisky in the form of a little quiz (with a very special prize for the smartest one). This night full of fun and drinks will take place on April 24 and will start around 17:30. Due to the bottlesize of whisky, obviously only a limited amount of places will be available. If you want to be there, make sure to sign up via www.gyrinus.nl/whiskytasting. Zin om je handen uit de mouwen te steken? En daarbij de vrolijkste en meest dankbare mensen een gezellige middag te bezorgen? Kom dan naar de Gyrinus activiteitenmiddag voor mensen met een verstandelijke beperking! Op 23 april zal je samen spelletjes spelen en lunchen met o.a. mensen met het syndroom van Down. Dit zal tussen 10:30 en 13:30 plaatsvinden bij een instelling. Mail snel naar ln.su1556186703niryg1556186703@eict1556186703ca1556186703 om je aan te melden! On the 17th of April it’s time to prove your trivia knowledge! Do you know the average height of an alpaca? Or do you know how many snow foxes have heterochromia? Or are you a trivia fanatic who is always looking to prove themselves to their selves, their peers and their parents? This is your time to shine! Humble all your opponents with your broad knowledge and take home the trophy! Have you always wondered what is to become of you after your study? Or what you can expect from life beyond the VU? Well, then this is a golden oppertunity for you, litterally. Because while you’re enjoying a glass of liquid gold, experienced Gyrini will tell you their stories of how their life went on. Sounds ideal right? So don’t hesitate and make sure you find yourself in the tegenstelling at the 17th of april at 16:00u. Be there! Anyhow, quickly sign up at ln.su1556186703niryg1556186703@eict1556186703ca1556186703 and we’ll see you the 16th! P.s. Also add a nice idea for a recipe we can cook! Does your wardrobe need some new shine? Do you want to show your love for Gyrinus? Then swing by the merchandise sale! 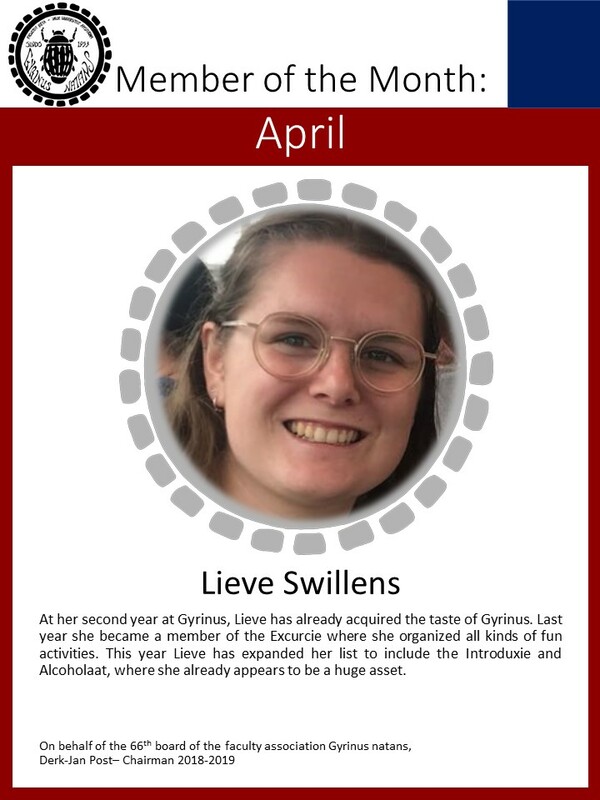 The board will set up a stand at the borrel on Wednesday the 10th of April where you can buy all sorts of indispensable Gyrinus items, such as sweaters (in 3(!) different colours), sweatpants, caps and more! Only two more periods before the end of the year! Do you want to end well, or do you still have to make that final sprint? Then make sure you have the right study books! As a Gyrinus member, you can buy all your books for periods 5 and 6 (Year 1 and 2) on Monday the 8th of April, with a 10-15% discount. For Biomedical Sciences: From 10:45 – 15:15 you can go to the Gyrinus room (P-022) for your books. You can pay with cash or (debit) card! Are you not yet a member of Gyrinus, but would you like to buy your books with a discount? No worries, you can become a member during the book sale! On a magical Tuesday evening in Madrid, Ajax showed the world how to play football. The mighty Real were sent from pillar to post. The Galacticos were degraded to Feyenoord’s level. Because we are Amsterdam, we are the best. We don’t just excel in football. We’re also the best in brewing beer. That’s why we will be demonstrating that our beer is the best, on a magical Friday evening in De Tegenstelling. Only the very best beers from Amsterdam will be poured so you can show us that you’re the best at drinking beers from Amsterdam on a magical Friday evening in De Tegenstelling. We’ll see you on April 5th at 17:00 in De Tegenstelling! Are you interested in doing a board year at Gyrinus natans or have you always wondered what the board actually does? Come to the Board information evening on Tuesday the 2nd of April! During this evening we will explain what a board year at Gyrinus natans looks like in general and how you can combine this with your study. In addition, the different functions will be explained, as every board member is busy with different tasks. There is, of course, plenty of time for asking function related questions as well as general questions. Your presence at this evening is completely without obligation! Registration is not needed, just put yourself on ‘present’ at the Facebook event, so we know how many people we can expect. Want a weekend away consisting of parties, exploring a new city and a lot of fun? Then this is your chance! We’ll leave on Wednesday evening the 29th of May and we’ll arrive back at the VU on Sunday the 2nd of June. The price is between 110 – 120 euros, including the bus trip and stay.